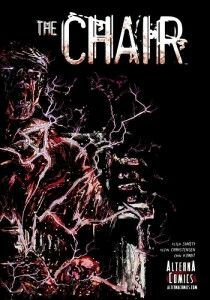 Alterna Comics‘ gritty psychological horror graphic novel, The Chair, is headed to the big screen. That is, with enough fan support via crowd funding website Kickstarter. Published in 2008, The Chair is written by Peter Simeti and features the artwork of Kevin Christensen with editing by Erin Kohut, who also adapted the book for film. Casting is well under way with huge acting announcements including Eric Roberts (Dark Knight, It’s My Party), Zach Galligan (Gremlins), Noah Hathaway (NeverEnding Story), and many more! The Chair features the story of a man on death row, Richard Sullivan. It takes an ugly turn when Sullivan, claiming he’s innocent, witnesses the brutal torture and death of his fellow inmates. The brutality soon drives the man to match horror with horror while also coming face to face with his own sanity. As an owner of the book, I can tell you this story is not for the squeamish. Translated to film, I can imagine the visuals will fill you with that awful feeling in the pit of your stomach. Add the psychological elements that the story employs and you’ll have nightmare fuel for weeks to come (the mark of a good horror movie, right?). If you’ve ever complained about the lack of smart horror flicks, THIS is your chance to make one happen. It’s a story that has deep roots in the dark places of the mind and has the ability to shock you in all the RIGHT ways. Blood and guts take a back seat to the games that this psychological freak show will play with your mind, and with the film seeking crowd funding for support, you can be directly responsible for scaring the people that see it! Bringing a film to life is no easy task, but for all the things involved, The Chair has a reasonable $300,000 goal. The majority of those fees are for the cast, crew, production, location and sets. To get to that point, the Kickstarter offers a number of rewards that provide anything from copies of the book, the film (DVD or Blu-ray), felt applique ornaments of film characters, signatures or personalized messages from actors involved with the film, original art and tons more. If you’re on a budget, it’s only $25 to get just the film, with your choice of format. I encourage you to give The Chair Kickstarter page a look over and choose how you’d like to be a part of bringing something HORRORable (heh) to life. Want to keep fresh on casting, production and other announcements? Follow The Chair on Twitter @theCHAIRhorror. Chip Reece (@ChipReece on Twitter) is a social worker by day and aspiring comic book writer by night. His book, Metaphase, was successfully funded on Kickstarter and due for release in Fall 2014, featuring artwork by co-creator Kelly Williams. Chip is more than excited to support The Chair movie because it’s creator, Peter Simeti, also happens to be the letterer for Metaphase! Good luck Peter!